In the final chapter of our bonus content for Requiem for Rome, we delve into the secrets of the very eldest Kindred, by whose measure the Senex is just a stripling. The Cross, the Chapel and the Spear: The secret origin of the Lancea et Sanctum. Blood and Bulls: Pagan cults in the era of Requiem for Rome. Wander any direction from the city, and you’ll see the ruins. The rotted outline of an old cottage, the pile of stones marking an old fire or an ancient grave. Go far enough the right way, to the east, journey by night and by sea, and you can stand among greater wreckage still. The remaining walls of the first cities, the sand that covers the footprints of the first men. You won’t be able to tell what any of them were for, not now. What did that wall support? Who chiseled that faint relief? There aren’t any answers. The ruins are ancient, silent, unknowable. But some of them are hungry. The dead are old, but their nights span only a few hundred years before they slip into torpor. Before they wake, their Blood thins and their memories change, colored by dreams and nightmares. For vampires, memory is a constant companion, but a treacherous one. Still, there are a few vampires who escape the Fog of Eternity. They may slumber, but they keep hold of their potent Blood. These Methuselahs remember their past as well as any mortal, and have the strength and cunning of creatures who have been elders several times over. The vampires of Rome have many stories about the Methuselahs, but these stories contain only fragments of the truth. The ancients keep their own Masquerade, concealing themselves from us as we conceal ourselves from the living: True, almost. Few Methuselahs have ever met, and they certainly don’t encounter each other frequently enough to have a culture or traditions unique to them. However, common problems breed common solutions: a vampire who has survived thousands of years has mastered hiding from both fearful mortals and jealous childer. Methuselahs hunger for the Vitae of the dead: True. A Methuselah suffers from the same rarified thirst that elders do. Like an elder, an ancient may sire other vampires to feed his hunger, but his longevity lets him make the sacrifice of Willpower to create them again and again. Childer may not be disposable, but they come close. A Methuselah might cultivate a brood for a few dozen years, and then destroy them in a single night of feasting. Methuselahs shirk the Fog of Eternity through the veneficia, or pacts with the Strix: False. No pagan ritual nor Theban miracle allows vampires to shirk the Fog of Eternity. Monstrous spirits might offer eternal memory, but they keep their promises only in part, or not at all. The ancients keep their memories and power by tremendous force of will. The ancients watch us, and subtly manipulate our every move: False. Methuselahs have their own, personal goals. They may well manipulate other vampires, but, like vampires, usually find that mortals make better tools. This is particularly true over extended periods of history; successive generations of human beings renew their determination and vitality. Vampires may hold their course against the currents of time, but this ultimately becomes a liability. Methuselahs possess every manner of supernatural power: True. While no Ancient is truly omnipotent, they have had time to unlock any secret of the Blood that an elder has, and likely keep them in greater numbers. A Methuselah may also have honed his skills to levels unheard of among humans. Like a younger vampire, though, he has trouble genuinely inventing anything. As our ancestors, the ancients may be called upon through Blood and sacrifice: True. As an extension of Blood Sympathy, a Methuselah can recognize her own grandchilder, no matter how many generations removed. Some or all of them may be able to hear prayers accompanied by the spilling of the supplicant’s Vitae. The sight or scent of Methuselahs drives vampires to Frenzy: Sometimes true. Most Methuselahs have found ways of limiting the effects of the Predator’s Taint upon other vampires they encounter, but the obscene potency of their Blood drives vampires to Frenzy and madness when unchained. There are few reliable accounts of meetings with ancients, but those stories almost inevitably feature a moment of recognition that permanently scars the younger vampire. More dubious tales claim that entire cities have been destroyed when an ancient passes through, driving the vampires to insanity and destruction in his wake. The “gothic” the genre is named for was originally a physical place or object, a long-dead artifact casting foreboding shadows over the present. The ancients are living ruins, whose preservation against age and sleep only makes them more alien and frightening, whose determination has worn away their fine details but reveals their terrifying strength. Use Methuselahs to remind players that history reaches back long before Rome, and that both mortals and vampires go back long before history. No convenient creation story can change that monsters from hoary prehistory still walk the earth. The Methuselahs represent difficult truths, but they’re also sources of knowledge; torpor, Nero’s fire and other losses make the memories of Rome’s elders unreliable at best. A neonate or ancilla who somehow gained the patronage of a Methuselah could find himself privy to information about his elders’ sins or the resting places of vulnerable vampires. That is, if the Methuselah is truthful and can be persuaded. Bargaining with ancients should be difficult but absolutely possible. Avoid the impulse to use a Methuselah as a tool to permanently block the players’ or characters’ goals. Similarly, try not to use them as “boss monsters.” Fighting a thousand-year-old vampire ancient might be cool once, but after that, everything else is a step down. That’s not to say never have a Methuselah present a physical danger. They should be frightening combatants just as they are frightening tacticians or manipulators. Just don’t make fighting them to the Final Death a regular occurrence. If it comes to confrontation, ancients generally aren’t enemies to defeat in a brawl or a debate; their many Disciplines and well-developed Skills make that difficult. Fleeing from or tricking one is slightly more feasible. The best way to avert the wrath of a Methuselah is to convince her you’re on the same side. The desires of the ancients are difficult to satisfy. Their goals have to keep them occupied across hundreds of lifetimes, yet the avenues of ambition open to the living are closed to them. No vampire will ever be an Alexander or a Caesar, no matter what rumors from Africa might claim. One might protect her mortal family, who she plans to forge into a tribe and then a nation. Every time they are nearly destroyed, she must start anew. Another might seek to master every discipline of mortal arts, only to find that mortals surpass him in every generation. An ancient may be well aware that her pursuits seem Sysyphian, but she is also certain that one day she will roll the boulder over the hill. Ancients usually have low Humanity, having inured themselves both to terrible acts and to plotting the same. At the same time, they don’t tend to have many Derangements; grievously insane vampires don’t become Methuselahs, and Methuselahs who degenerate don’t survive. An ancient might have many strange habits and ideas, but these rarely impede his function. On the other hand, a Methuselah’s Virtue, Vice and Derangements are good weaknesses for characters to exploit. The creature called Zagreus tells many stories of his origins. This is only one. The man was born in Babylon, near the beginning of Hammurabi’s reign. He learned to speak when his mouth could scarcely form the words. Brilliant as a child, he grew to be a great scholar and a charismatic priest. He fawned over Hammurabi as the king imposed his code of law, and eventually sat by the king’s side in judgement. The young priest became ill with a wasting disease, and was tended by a woman who had grown fond of him. The granddaughter of a vampire, she knew that her ancestor’s blood still preserved her mother’s youth. She went to the vampire’s cave and endured the caresses of his thralls, begging for her beloved’s life. The old monster had little sentiment left, but listened as his descendant spoke eloquently about the priest’s virtues. Finally, he decided to grant her request, but instead of making the priest a ghoul, the vampire Embraced him. The night cowered before the dead priest’s righteous glare. In a century’s time, he had driven away the beast who sired him and claimed Babylon as his own domain. He grew lonely, for he had forgotten the young woman in his early nights, and she had died of the same disease she saved him from. The priest sired a brood, but was driven into the desert by them, just as he exiled his own sire. He found another city, and sired another brood, but destroyed them before they could grow mighty. Eventually, he developed a method: creating fledglings once every few decades, and only ever appearing to them cloaked in an aura of awe and wisdom. He teaches them that he is God, and they are his special creations. Essentially, he forms blood cults of vampires and uses them to sustain himself. When he must commit himself to a period of torpor, he transfixes a number of them to feed upon when he awakes and leaves the rest to spread his word. Eventually, he wakes and joins his own cult. The priest took the name Zagreus from a God he worshipped briefly in Greece, before he abandoned the Dionysian mysteries for those of the Orphics. He wants to meet God, and that’s the only reason he bothers with vampires or mortals outside his cattle-cults. Since his mortal youth, he has believed implicitly in a divine lawgiver, a being like the king he so admired, but with dominion over the entire world. Yet, his studies with countless mortal cults and his own process of thought have revealed to him numerous problems with that proposition. Similarly, he believes his vampirism is a state of divinity, but has yet to deduce its purpose. He has learned that a weak “blood-god” may become greater by devouring a strong one. Thus, he sifts patiently through every belief of the living and the dead, looking for the true path to reach and devour his almighty lord. Description: Zagreus looks like a young man who has seen too much of the sun, perhaps a caravaner. His features are unusual, but generally suggest West Asian heritage. His accent is also foreign; Egyptian, usually, but completely unidentifiable when he allows his disguise to drop. Storytelling Hints: Zagreus presents himself as a neonate or ancilla, and can mitigate the Predator’s Taint to mimic either. He is currently travelling towards Rome. He’s spoken with missionaries from the Spear, and their mysteries make more sense to him than anything he’s heard in a long time. He travelled through Jerusalem shortly before the execution of Jesus, and wonders if God’s son might have been there to meet him. Having missed that chance, he wants to absorb the teachings of Longinus, and discover where the centurion dwells or sleeps. Zagreus uses Majesty freely, but takes great care to make sure that he appears to be winning friends, students or worshipers by natural charisma or (much more rarely) radiant divinity. He’s good at blending in, but won’t bother to disguise his curiosity if something seems particularly important; he’s confident in his ability to make excuses afterwards. This seems very inspired by Anne Rice’s ‘Queen of the Damned’ and ‘ Vampire Lestat.’ Were these important sources for your conceptualization of Methuselah’s? What other sources did you use (besides the obvious WOD/Vampire rules)? Actually, the main sources were She: A History of Adventure by Henry Rider Haggard and “The Moon of Skulls” by Robert E. Howard. Miriam Blaylock from The Hunger also figured in there somewhere. I should credit Will Hindmarch for doing the initial outline for Requiem‘s Methuselahs, back when we started Requiem for Rome the first time. Will was the one who insisted that becoming a Methuselah wasn’t a ritual or Discipline power, and that’s an angle I particularly like. You’d have to ask him what his sources were. I wasn’t too impressed by Zagreus when I first read Immortal Sinners, and I’m still not too huge on the whole concept for a couple of reasons. 2: I’m generally not fond of super powered NPCs with powers that the PCs have no way to replicate. I suppose “Be born 5,000 years ago before whatever cursed vampires with the Fog of Ages and whatnot” isn’t really something my character can aspire to, but adding that these guys break the rules just because only makes me like them less. That said, I’m still really happy with everything else in Requiem these days, so one NPC that I won’t use and a type of NPC who won’t exist in my games really isn’t a big deal. I’m just not at all interested in seeing more of these guys. While I’m not entirely on board with your conclusion, I share your concerns. I was also pleased that Requiem did away with godlike elders. And I think it was very important to keep them out of the line for several years. 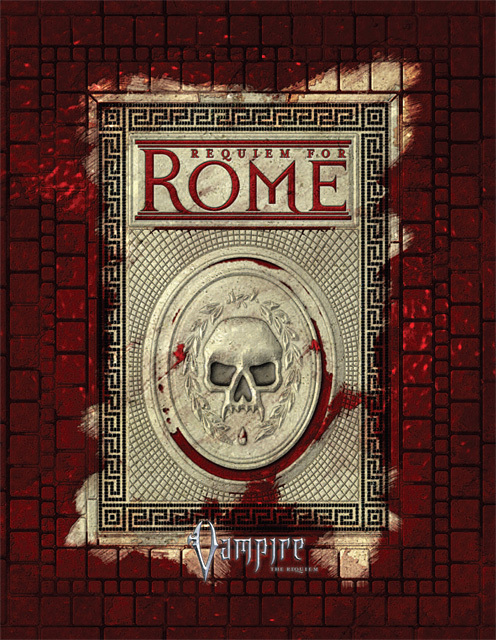 Will revisited the notion when he and Ray were developing Requiem for Rome, and although I was a little leery of the idea in general, I thought it fit well into the Roman setting, which I viewed in part as a historical sword and sorcery setting. We talked about it a lot, but ultimately left the idea as a 50-100 word plot hook for the modern nights in Fall of the Camarilla. I guess it was about a year later when I was developing Immortal Sinners. Sinners followed the clan books, so it had to take place in the updated, up-to-the-minute Requiem setting, and the characters had to be at least interesting and exotic enough to stand beside the ones who were actually interviewed or contributed their diaries to the clan books. One of the things that early Requiem downplayed to set itself apart from Masquerade was the idea of vampires as transcending history. In getting away from Napoleon-is-a-Vampire, we had to go pretty far the other way, in saying that no one even old enough to know Napoleon could be trusted. That was a direct sacrifice: a loss for a gain. By 2008, though, things were different. Everyone knew Requiem wasn’t Masquerade, so now we were free to be Vampire in any way that worked. One thing that I wanted to bring back, in a limited dose, was the vampire who transcends history. This was a choice heavily informed by the intention that the book would provide enemies for characters from other lines. At the same time, I didn’t want to break the mechanical ecology of Requiem, or drown player characters in unbeatable bad guys. And Lord, Lord did I never want to introduce 6+ dot Disciplines. So Zagreus has a broad range of abilities at high levels, but doesn’t exceed other elders, or advanced player characters, in any specific field. His only really unusual number is Blood Potency, and play experience shows that the amount of Vitae a character can store and spend becomes a game of diminishing returns. Vast pools and spending abilities can even become a vulnerability, if the ST’s actually paying attention to Vitae use by NPCs (something the system encourages, but which I think it should probably downplay) and the means they need to employ to get it back. I also was worried about things that players could never achieve. While most Vampire chronicles I’m aware of stick to the now, I was worried about creating some kind of “insurance” Merit or ritual or something that people (especially in the Camarilla Global Chronicle) would come to see as mandatory. So the out for the Fog of Eternity is essentially ST’s permission, not an advancement tax. I probably should have called that out specifically way back in Immortal Sinners. On the setting side, a uniform way of escaping the Fog of Eternity implies a worrisome uniformity to ancient Kindred. Given that the Kindred are, in fact, several different kinds of creature united by Humanity, and the vast existing evidence that even elders become progressively more distinct from younger vampires, special circumstances and ST fiat seem like the best route. I was determined to detail only one Methuselah, however, so getting into his “special circumstances” would have ended up essentially stating a One True Way. So the book stayed silent on the matter. For all these boasts of mechanical rigor, though, I actually regret the Devotion in Immortal Sinners. It’s one of those things that, even if it “made sense,” we should never have built a rule for. Poor choice on my part. The clan books and Immortal Sinners really pushed the limits of Devotions, and not in a way that I’m completely happy with. The idea that all non-Discipline powers are essentially combos creates some bizarre stat blocks, and often encourages a player who wants a particular Devotion to make counter-intuitive choices in advancing their character. Devotions work for what they are in the core, but have become a problematic solution to some of the game’s other needs. Skip to a few weeks ago, when I decided to do some new Requiem for Rome material. I figured I’d like to go back to the idea of vampires transcending history in a way appropriate to that setting. I didn’t actually want to introduce a new Methuselah, though — even with appropriate restraint exercised on the mechanical end, it’s dangerous to introduce too much of this into the setting. So, instead of a new guy, I went back to Zagreus. I gave him a story that works better with Requiem for Rome, but which leaves his original backstory potentially in place. At the end of the night, that means we still only have one ancient. While I’ve got some idea of what I’d do with them if they were introduced as a regular NPC type, I’m not rushing to do that right now. I’m glad you’re enjoying the line so much. The second phase of Requiem has been a total joy to be a part of. And, you know, sales numbers are nice to see and all, but it’s so much better when somebody says something nice outright. Thanks. I have to think about this, but there is huge part in that wants to trash the whole idea of the Methusalem on instict and ‘just because’. There was always the possibility to have the guy who know Napeloen and there was also the possibility that that part of his memory escaped torpor relativly unscathed. Why codify it and potentially break the game balance? One of the advantages of having had six years since launch is that Masquerade baggage is less of an issue than it was in 2004. It’s well-established now that Requiem has its own spin on Vampire. Which is not to dismiss the concern about repeating ourselves, which is something I take pretty seriously. In this case, though, I’m happy to revisit something from a different angle. I think it works well, particularly for the Rome setting. If this were a full book, though, and I was presenting The Rules, I’d address balance issues in detail. “Boss monsters” are an iffy proposition in the Storytelling system, and you want to design for the fact that virtually any character who looks sufficiently badass on paper will be somebody’s boss monster. There’s a lot more to be said about balancing Requiem that I don’t want to get into off the cuff. As for the Fog of Ages, it should actually help you run historical characters, both for players and otherwise. That however, is also a topic for another time. Why does it fit better with RfR than with ‘vanilla’ Requiem? Thanks for the reply. Even if I doubt Zagreus will ever show up in my game, I can at least see the logic behind it. Our current game actually features a bit of the Vampires Out Of Time angle. One PC was embraced in WWII, and slept through most of the 60s and 70s, and one of the major villains of the chronicle was a Roman general Embraced in Britain who is, while not based on a real person and with a pretty foggy recollection of his past, a real historic monster. With the release of Imperial Mysteries for Mage, does it bring anything new to mind for this and vampire getting a similar supplement? Maybe a Super Template of the Methuselah with a broad trial of becoming or some sort of potential options? I’m really interested in seeing some sort of content like that for Vampire. I don’t currently have any plans for that, but I’m keeping it in mind.